One day soon you may be staying at a Hilton hotel and, when you ask for directions to the pool or what time breakfast starts, the concierge helping you may be a robot. Hilton and IBM announced on Wednesday that the companies are teaming up to pilot a smart robot, dubbed Connie, that will act as a hotel concierge, answering guests' questions and learning as it works. 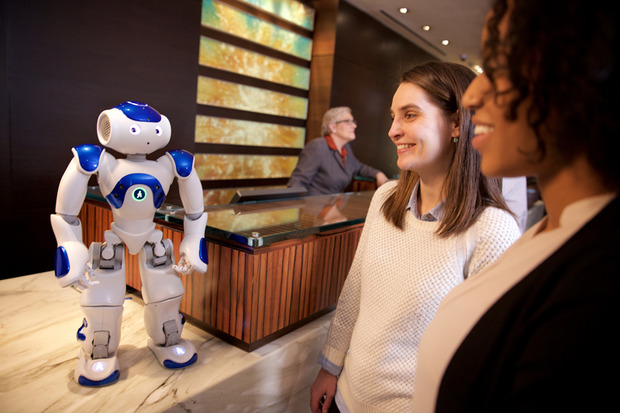 Connie, which will be working in a pilot test at the Hilton McLean in Virginia, is designed to interact with hotel guests and answer questions about hotel amenities, local attractions and dining options. "We're focused on reimagining the entire travel experience to make it smarter, easier and more enjoyable for guests," said Jonathan Wilson, vice president of product innovation and brand services at Hilton Worldwide, in a statement. The robot is using IBM's Watson machine-learning APIs, like speech to text, text to speech and its natural language classifier. The more guests interact with Connie, the more it learns, adapts and improves its recommendations. The project also is pulling in WayBlazer, a cognitive search platform focused on travel. The robot, built by France-based Aldebaran, which also makes the well-known Pepper robot, is a NAO humanoid robot that is approximately 23 inches tall. (Pepper is nearly 5 feet tall.) According to the company, NAO is in its fifth version and 7,000 have been sold. Having a robot helping hotel guests isn't a new idea. About a year ago, Aloft hotel in Cupertino, Calif. began using an autonomous robotic butler to deliver small amenities -- like toothbrushes or a small snack -- to guests' rooms. The robot has been so popular that the hotel chain has decided to bring similar robots, called Butlr, to two of its other properties. The Hilton project, though, is taking this idea a step further. Instead of simply using the robot to travel to the guest's room and deliver something, Connie is designed to actually interact with guests. The hotel is hoping Connie will be able to answer guest questions like where they should go to find great Italian food or where the best mini-golf course is nearby. And because of the machine learning aspect of the robot, the more interactions Connie has with guests, the more it will learn about what guests want and hone its recommendations. "This project with Hilton and WayBlazer represents an important shift in human-machine interaction, enabled by the embodiment of Watson's cognitive computing," said Rob High, vice president and chief technology officer of IBM Watson, in a statement. "Watson helps Connie understand and respond naturally to the needs and interests of Hilton's guests, which is an experience that's particularly powerful in a hospitality setting, where it can lead to deeper guest engagement." Patrick Moorhead, an analyst with Moor Insights & Strategy, called Hilton's robot an advance in machine learning. "This is an innovative use of machine learning," he said. That said, he sees this as more of a "friendly form factor" than a full-on robotics implementation. However, he suspects other businesses will be paying attention to Hilton's pilot test. "I think other businesses may be able to improve customer service and satisfaction, replace dumb kiosks or even people who perform this similar task," said Moorhead.